COOKIE CRUST: Preheat oven to 350°F. Spray 8-inch round tart pan with non-stick baking spray and prepare cookie dough according to package instructions. Press half of the dough into an even layer in the bottom and up the sides of the tart pan. Reserve remaining half of the dough for another use. Freeze for 15 minutes, then bake 10-14 minutes until golden brown. Remove from oven and cool completely. PASTRY CREAM: Combine half-and-half, 6 tablespoons sugar and salt in a saucepan over medium heat, stirring occasionally, until sugar dissolves and mixture begins to simmer. Meanwhile, whisk egg yolks in a glass mixing bowl for 10 seconds before adding 2 tablespoons sugar. Once combined, add cornstarch and whisk until the mixture is pale yellow and thick, about 30 more seconds. Slowly drizzle the hot half-and-half mixture into the eggs, adding gradually and whisking constantly. Return everything to the saucepan and cook over medium heat, stirring continuously until the pastry cream has thickened and 3 or 4 bubbles burst on the surface (mixture should appear thick and glossy). Immediately remove from heat and stir in the cold butter and vanilla until butter is completely melted. Pour pastry cream into a glass bowl, press plastic wrap directly on the surface and refrigerate for 1 hour until cool. JAM: Heat the jam in a microwave-safe bowl on high power in 20-second intervals, stirring after each, until jam is melted and thin, straining out any chunks of fruit. Brush 1 tablespoon of the jam over the cooled sugar cookie crust and set aside 15 minutes to dry. Stir the chilled pastry cream then pour it into the crust. Cover the tart with plastic wrap and refrigerate for two hours. 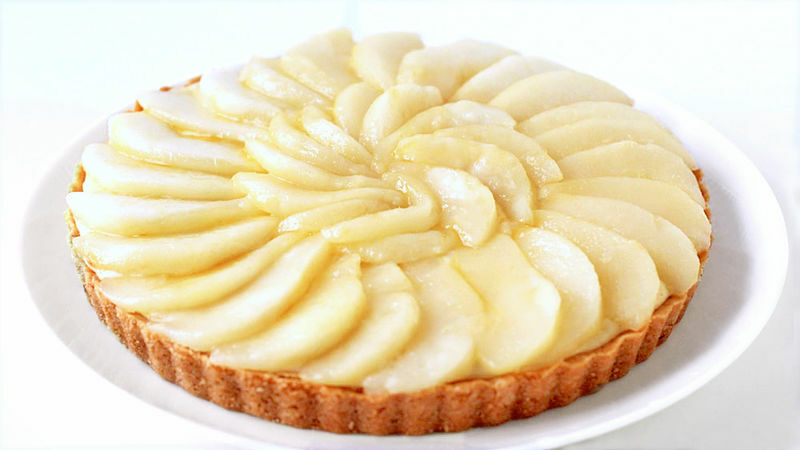 PEARS: Melt butter in a 12-inch skillet set over medium heat, then add in 1/2 cup of jam (save remaining 1 tablespoon for brushing over top of finished tart), sugar and pear slices. Stir in the lemon juice, tossing pears to coat, and heat for one more minute. Remove pears using a slotted spoon and discard liquid. Allow pears to cool at room temperature for 15 minutes, then refrigerate until cold. Before serving, arrange the pears on top of the pastry cream. Reheat the reserved jam on high power for 10 seconds in the microwave until thin, and brush over the top of the pears. Serve immediately or cover and refrigerate for up to 12 hours. Measure out all of your pastry cream ingredients before you begin—you won’t have time to do it during cooking.